Casey and Wendy Dropkin (inset) are biking 4,000 miles to raise money to buy bulletproof vests for police dogs in Massachusetts. It didn’t take much for Casey Dropkin, V16, to persuade her mother Wendy to bike 4,000 miles cross country. Mother and daughter started off from Puget Sound in Washington on June 5 and plan to pedal for 67 days, following the northern-tier map from Adventure Cycling to Portland, Maine. Skirting the U.S.-Canadian border, the route crosses four mountain ranges—the Cascades, Rockies, Adirondacks and Appalachians—and passes through Glacier National Park and by the Great Lakes and Niagara Falls. Casey said they hope to cover 60 to 80 miles a day. “We’ll be pretty loaded up, with four panniers on each bike to carry our sleeping bags and camping equipment,” she said. To pay their way and raise money for a worthy cause, the Dropkins set up a fundraising webpage. So far, they have raised $2,600, the majority of which will be donated to Massachusetts Vest-a-Dog, which provides bulletproof vests for law-enforcement K-9 programs. 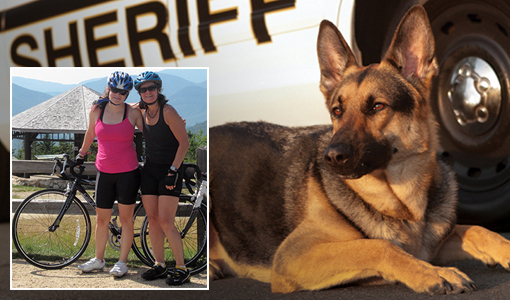 Casey said that she and her mother chose to ride for the nonprofit because it recognizes their love of animals while also honoring her father, a police officer, firefighter and EMT in Waterville Valley, New Hampshire. They were inspired after meeting Sgt. Dustin Parent, a police officer from nearby Guilford, and his partner, Agbar, a German shepherd that recently retired after serving the town for seven-plus years. Follow the Dropkins’ journey via real-time GPS updates and blog posts at dropkingirlsbikeusa.blogspot.com.